Hybrid tea roses are often the type thought of as the traditional, long stem variety of rose. There are many different types and breeders are always working on exciting new developments! As the name suggests these flowers are a cross between Hybrid Perpetuals and traditional Tea Roses. It gets the best traits from both the breeds. The vigorous growth, sturdy stems and hardiness are trademarks of Hybrid Perpetuals whereas the Tea Rose contributes to the beauty of the flower with exotic leaves, continuous blooms and high center. The Hybrid Tea rose is often termed as the " modern rose”. The Hybrid Tea came into existence in 1867 in France. It was introduced by a French Gardener Jean-Baptist Guillot. Since then many other cultivators and gardeners have experimented on this Hybrid Tea roses to get wide varieties of this rose. The rose became popular only in the 20th century with the huge success of the Peace rose which was introduced at the end of the Second World War. Many other breeds followed, including the Explorer series. Hybrid teas have beautifully formed large sized blooms with high centered budding. They stand upright on long single stems adding to the elegance of the flower. The diameter of the flower varies in between 8 to 12 cm. Tea hybrids will grow in a straight shrub pattern and attains a height up to 1.8 meters, with regular blooms throughout the season. These are some of the popular varieties, as well as a few that are little less common but still great value. You will find lots more by browsing through the website. Double delight rose: This is a strongly fragranced flower. It grows as tall as 150 cm and blooms double colored flowers with the shade of white inside and deep red on the edges. This rose typically has 32 petals. Camp David: This flower first appears as a black bud and opens up to a spectacular red color. This is a great addition to a bouquet. Mister Lincoln: It has a very strong fragrance and beautiful well spread red color. The bloom size is of 30 to 35 petals. It was introduced in the year 1964 and grows up to the height of 1.2 meters. Hardiness zone is from USDA zone 5-9, which makes it good for cooler climates. Bridal: Bridal is an awesome light pink color rose with a lovely formation. The flower is sturdy and lasts long on the stem. 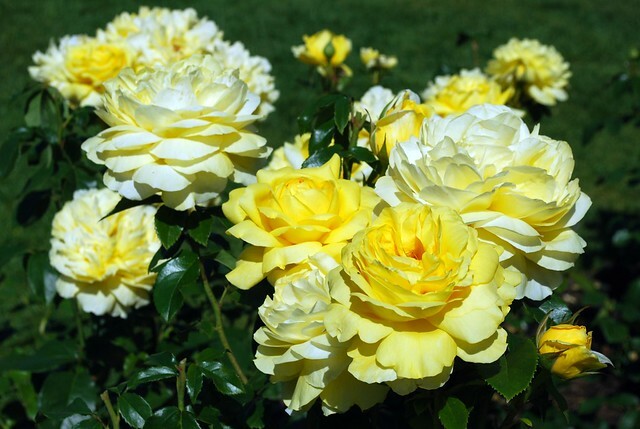 The rose shows regular blooms of 21 to 24 petals each. The hardiness zone for this lovely Hybrid Tea Rose is from USDA zone 6 to 10. Aloha: A great climbing shrub with a nice scent. Abracadabra: One of the most uniquely colored roses. Red with yellow stripes.